Glass beads were an important item in West African cultures, finding their way into the region prior to the 15th century through the trans-Sahara trade with North Africa. They functioned as ornamental items: strung into jewelry, belts, and rosaries, woven in hair, and sewn onto clothing and headdresses. Beads were also used in rites of passage or initiation ceremonies, used in protective charms and talismans, and found on statues and figurines. In addition, they were markers of wealth and social status, used as currency, and to identify members of political offices, religious practitioners, cult members, and deities. Prior to European importation of glass beads, Africans made their own from bone, ivory, seeds, shell, stone, wood, and sometimes glass. However, during the Transatlantic Slave Trade, Europeans made an effort to trade items already in demand, thus expanding the existing trade of beads to include European-manufactured glass beads. As glass beads entered Africa at an unprecedented quantity, their importance and value was elevated for Africans, both slaves and their captors. When Blackbeard captured La Concorde in November 1717, he retained between 60 and 160 of the Africans onboard, and left the remaining French crew and the rest of the enslaved on the island of Bequia. Although it is unknown what happened to the slaves Blackbeard took, the enslaved peoples left their mark on the Queen Anne’s Revenge through material goods such as shackles and glass beads. Approximately 800 whole and fragmented glass beads have been recovered from the Queen Anne’s Revenge. Although there are numerous methods of bead manufacture, the QAR assemblage consists of only simple drawn yellow, blue, white, or black glass beads. To make a drawn bead, a small amount of molten glass is gathered on the end of a blowing rod and blown into a bubble. 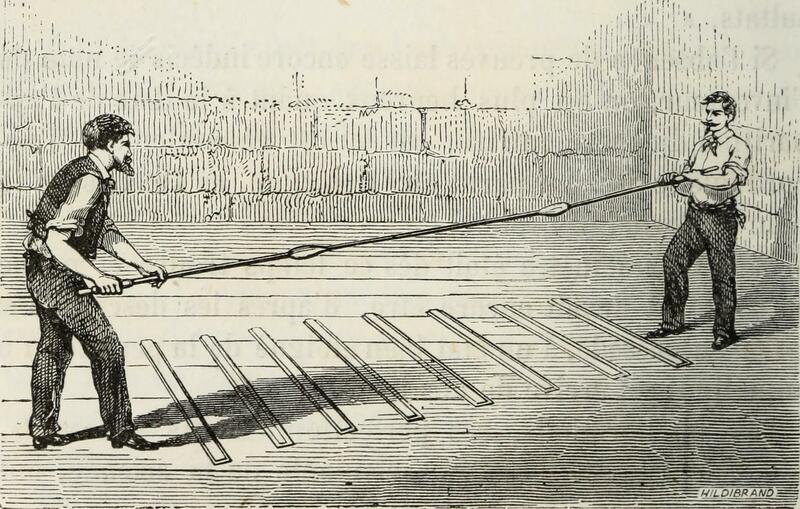 A second rod is then attached to the bubble, and the two glassblowers pull in opposite directions, stretching the glass into a tube until it becomes too cool to pull. The tube is then laid on a slab of wood and broken into short lengths that are further chopped into desired sizes. Beads can either be left in this condition or reduced into oval or rounded beads with further treatment. The finished products are then sorted by size and strung into “hanks,” a grouping of approximately 4,000 beads dispersed on 12 strings. Beads are then transported from Europe to Africa on slave ships and traded with African captors for goods and human cargo. -Handler, Jerome S. (1997) An African-Type Healer/Diviner and His Grave Goods: A Burial from a Plantation Slave Cemetery in Barbados, West Indies. International Journal of Historical Archaeology 1(2):91-130. -Kidd, Kenneth E. and Martha Ann (2012) A Classification System for Glass Beads for the Use of Field Archaeologists. BEADS Journal of the Society of Beads Research 24:39-61. 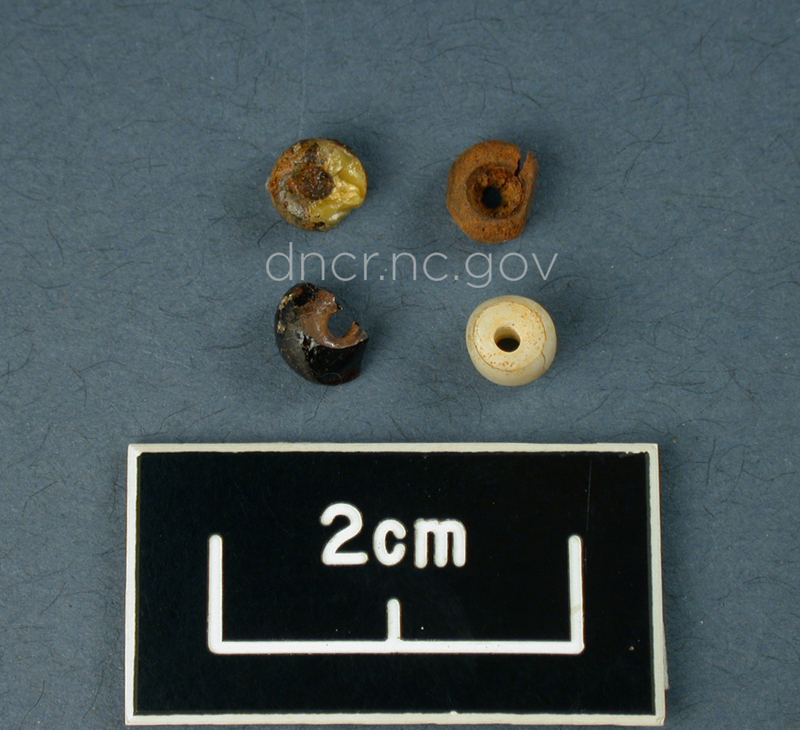 -Glass beads from the Queen Anne's Revenge Shipwreck, courtesy NC Department of Natural and Cultural Resources.